If you’re considering getting a real estate license in South Carolina, first familiarize yourself with exam registration and pre-licensing course requirements. Then, complete a background check, take the pre-licensing courses, and pass the licensing exam. Finally, complete the remaining education requirements before submitting your final license application and choosing a sponsoring broker-in-charge. When you start gearing up for the real estate exam, use exam prep to make sure you pass on your first try. Real Estate Exam Prep Master is an online program that provides prep courses, study guides, prep tests, and a guarantee – if you don’t pass the first time, you don’t have to pay. Click here to get started. In order to get a real estate license in South Carolina, you must be 18 years of age or older, have at least a high school diploma or GED, and complete 90 hours of pre-licensing courses. Applicants do not need to be a resident of South Carolina, but all applicants must undergo a background check. Below is a quick breakdown of the real estate licensing requirements in California. Age: Applicants must be at least 18 of age or older. Education: You need to have at least a high school diploma or GED. Residency: Any U.S. citizen or a lawfully admitted alien can apply. You do not need to be a resident of South Carolina to apply. Fingerprinting and background check: Applicants must submit to a background check prior to submitting an application for the licensing exam. This can be done through an online portal. Pre-licensing courses: Aspiring agents must take 90 hours of real estate education in various national and state-specific subject areas like property and contract law, agency principles, and real estate financing. Professional experience: Applicants for a salesperson license do not need to have any real estate experience prior to taking the exam. Fees: Applicants must pay $40 for a background check, $63 to register for the exam, and $75 in application fees. Aspiring agents must also pay for state-approved pre-licensing courses; course costs vary by provider. Aspiring South Carolina real estate agents must pass a background check, meet pre-licensing education requirements, and register for (and pass) the licensing exam. After you pass the exam, complete and submit your license application, identify a market, and choose a supervising broker-in-charge who will oversee your actions as an agent. Once licensed, it’s also necessary to maintain adequate continuing education credits. South Carolina requires salesperson license applicants to undergo a background check before applying to take the licensing exam. To complete this process, visit SR&I, a pre-employment services company, and submit your information through the Authorization for Release of Information. You will be asked to create an account, provide background information, and pay a fee of $40. Once you submit the online form, it takes 72 hours to complete the background check. You will receive an email when the check is complete, and can review a complete report on SR&I’s dashboard. To get a real estate license in South Carolina, complete 90 hours of real estate pre-licensing courses, including 60 hours of Real Estate Principles courses before you register for the licensing exam. After completing the coursework, you will receive a certificate of completion to submit as part of your examination application. Aspiring agents must take an additional 30 hours of advanced pre-licensing coursework, which can be taken after passing the exam but must be taken before you can apply for a license. These classes cover subjects like real estate principles, practice, and calculations. For more information on pre-licensing courses, visit the South Carolina Real Estate Commission’s website for the current course schedule and a list of state-approved course providers. For course recommendations, read our article on the best online real estate schools. Before studying and registering for the South Carolina real estate license exam, familiarize yourself with the state-specific and national subjects that will be tested. The salesperson exam includes a total of 110 multiple-choice questions that cover both national and state-specific content. Questions are broken up into approximately 15 general topic areas; make sure you note which subjects will be most challenging and prioritize them when you study. The South Carolina-specific portion of the salesperson licensing exam includes 30 questions, and test-takers have one hour to answer them. Questions cover topics including laws of agency, fiduciary duties, financing, transfer of property, and more. 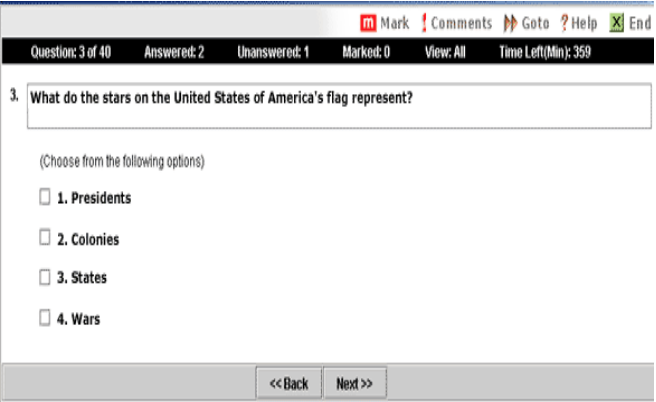 In addition to state-specific real estate knowledge, South Carolina test-takers must answer 80 multiple choice questions that cover national real estate topics. You will have two hours to answer the national questions. Subject areas cover property and contract law, financing and real estate calculations, property disclosures, and general agency principles. A large volume of national and state-specific material is covered on the South Carolina real estate exam, so be sure to start studying early. The state’s required pre-licensing courses are a great introduction to the information you need to pass the exam. However, it’s recommended that you take an exam prep course so you have access to additional review materials like online lectures, flashcards, and subject outlines. You should also complete at least one practice exam. To answer questions covering a broad range of subjects in a limited amount of time, master all of the subjects and learn how to apply the knowledge quickly and accurately. Taking a real estate exam prep course can simplify the studying process and make it easier to digest large volumes of study materials. Prep courses typically cost $29 to $200 and offer outlines, lectures, and online communities to help aspiring agents prepare for the licensing exam. If you work hard and take the courses seriously, you should have no problem passing the exam. If you’re looking for help studying for the test, check out the Exam Prep Master program from Real Estate Express. You get practice and final real estate exams, real estate math questions, and hundreds of real estate definitions to help you successfully pass your exam. In fact, if you don’t pass your exam on the first try, you get your money back. Click here to get started. After you familiarize yourself with exam topics and study frequently-tested material, dedicate time to answering practice questions and taking full-length, timed practice exams through an online exam prep provider. By doing so, you will review important information, learn how content will be tested on the exam, and identify challenging subjects. 1. Which of the following interests in property is held by a person who is granted a lifetime use of a property that will be transferred to a third party upon the death of the lifetime user? 2. Which of the following statements BEST identifies the meaning of the term “rescission of a contract”? 3. Which of the following clauses in a mortgage allows the lender to demand loan repayment if a borrower sells the property? 4. How much cash MUST a buyer furnish in addition to a $2,500 deposit if the lending institution grants a 90% loan on an $80,000 property? 5. Which of the following single-family residences would get the MOST accurate appraisal by applying the reproduction cost approach to value? After you study for the exam and are confident you’re ready to take the test, complete and submit an application to the South Carolina Real Estate Commission (SCREC) to take the exam. Once you’re deemed eligible to take the exam, register for a test date online. After completing the Real Estate Principles course, apply to take the South Carolina Real Estate license exam through the SCREC. To apply, visit SCREC’s online application portal and pay the initial application fee of $25. Once you submit your application to take the exam, it will take an average of five to seven business days for the Commission to process and approve your materials. After the SCREC approves your application to take the exam, register for an exam date and location through PSI’s online portal. The registration fee for both the state and national portions of the salesperson exam is $63; one portion is $55. Processing times vary depending on how you register. Registration will be immediate online and via telephone; fax registration can take up to four days; and mail registration takes up two weeks. We suggest studying for the exam first and then registering for an exam date when you feel prepared. However, keep in mind that you have one year to take the exam after your application is approved by the Commission. You may take the exam an unlimited number of times within that year. For more information on the registration process and for a copy of the registration form, visit the Real Estate Candidate Information Bulletin. On the day of your exam, arrive at the testing center at least 30 minutes before the exam is scheduled to begin so you can complete sign-in procedures. The exam will be administered on a computer and you will have the opportunity to complete an introductory tutorial before starting the actual examination. Once the exam starts, one question will appear at a time. Complete the exam in the allotted three hours, then wait for pass or fail notification. Primary form of identification: Test-takers must present at least one valid form of government-issued identification (driver’s license, state ID, or passport) with your signature and a photograph or complete physical description. Second form of identification: The second ID must have your signature and pre-printed legal name. Both forms of ID must match the name on your registration form and Examination Eligibility Form. 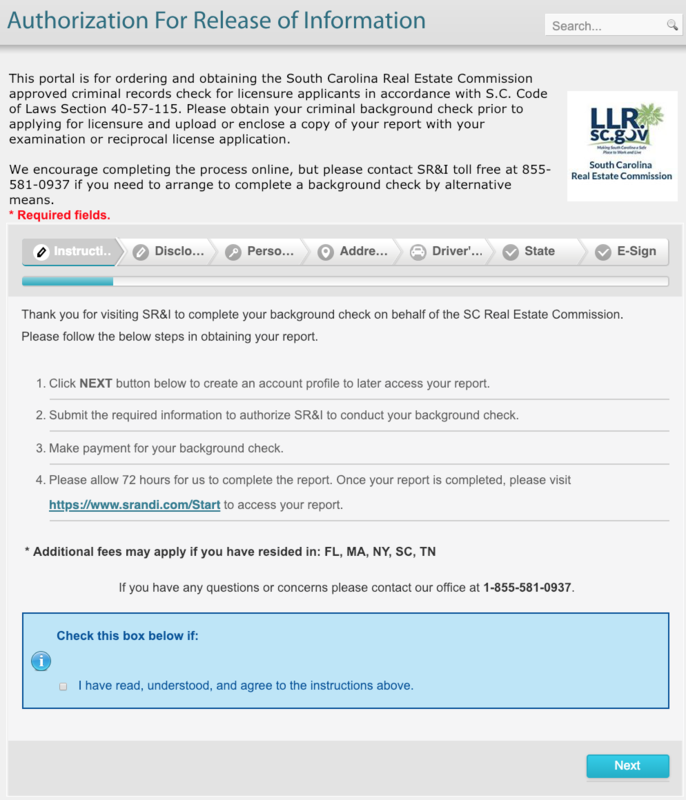 Examination eligibility form: After applying to take the exam with the South Carolina Real Estate Commission, you will receive an examination eligibility form that is good for one year. Bring a copy of this document to the testing center and make sure the name matches the name on both forms of personal identification. Registration form: Print the confirmation you receive after registering for the exam and bring it with you to the testing center. As with the Examination Eligibility Form, the name on the registration form should match the name on both forms of your ID. Non-programmable calculator: Test-takers may use a non-programmable calculator that is silent and battery-operated. The calculator may not have paper tape printing capabilities or a keyboard containing the alphabet. Personal items: Test-takers should not bring cell phones, purses, wallets, lapel pins, tie tacks, backpacks, briefcases, or suitcases to the testing center. These items must be placed in the secure storage provided before you enter the room. Food and drink: No food or drink is permitted at the testing locations. Study materials: Applicants should not bring any of their study guides, books, flashcards, or other study materials to the testing center. Electronics: Tablets, portable computers, PDAs, calculators, cameras, video or digital recording equipment, watches, or other items deemed inappropriate by proctors are prohibited. To pass the salesperson exam, you must answer 56 national questions and 21 state questions correctly. You will be notified of whether you passed immediately following the exam. Test-takers who pass the exam are not informed of their final score. However, those who don’t pass are notified of the actual score and the percentage of questions answered correctly in each subject area. If you do not pass the exam, you must re-register to take the exam at a future date. 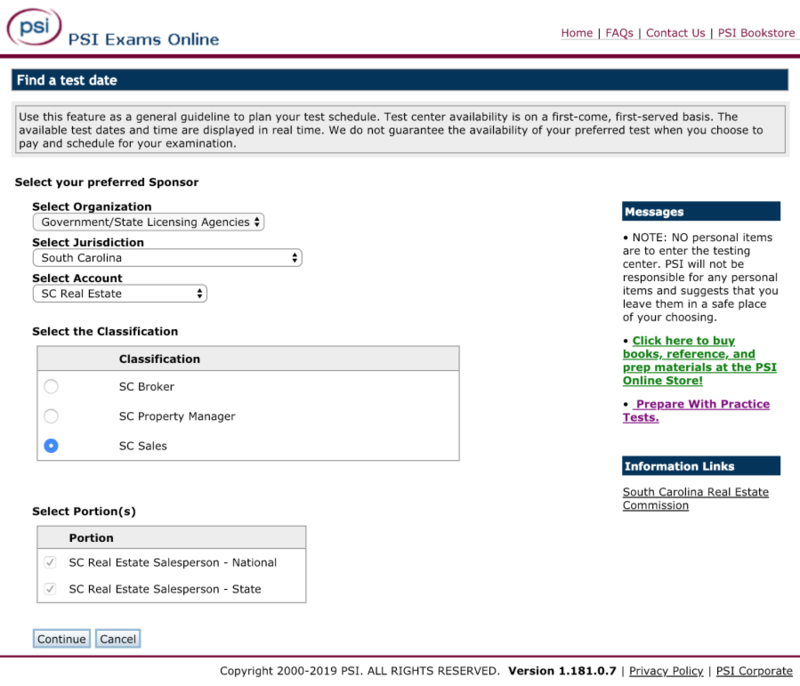 However, if you retake the exam within one year of your initial application, you do not need to re-apply through the South Carolina Real Estate Commission’s office; simply schedule a new testing date via the PSI portal. You may register for and retake the exam an unlimited number of times within your year of eligibility. In addition to completing 60 hours of pre-licensing education requirements, applicants must take 30 hours of Unit II: Advanced Real Estate Principles courses. These classes may be taken before you register for and pass the licensing exam but are not required until after you pass the exam and are preparing to submit your final license application. Visit the South Carolina Real Estate Commission’s website for more information about available Unit II courses. To work as a licensed real estate agent in South Carolina, you must be sponsored by a broker-in-charge who is licensed to oversee agents in the state. Fulfill this requirement by identifying a sponsoring broker as part of your completed license application. If you already have a relationship with a brokerage or have a mentor in the industry, this decision may be simple, but we compiled data on top performing teams in the state to give you a starting point. What are the average commissions and how are they split among agents? Will the brokerage or agency pay for marketing resources and advertisements? Visit our in-depth guide to choosing the right agency for more information on how to research, vet, and select real estate agencies. If you’ve narrowed it down to large brokerages like Keller Williams, RE/MAX, and Century 21, check out our buyer’s guide comparing the three. If you’re licensed in another state, a South Carolina resident, and want to get a real estate license in South Carolina, you must meet the same general age, education, examination, and experience requirements as new agents. If you’re not a South Carolina resident and are licensed elsewhere, you may qualify to take the licensing exam without taking the pre-licensing courses. Agents licensed in other states must also submit a Certificate of Licensure with a license history, a summary of your education, and disclosure of disciplinary actions from other states where you held or hold a license. Agents who are already licensed in Georgia and want a South Carolina license can avoid taking the licensing examination by completing a Salesperson License by Reciprocity Application, meeting various administrative requirements, and obtaining an SCREC-approved criminal background report. For more information on how to apply for a South Carolina real estate license as an out-of-state agent, visit the South Carolina Real Estate Commission’s website. After passing the real estate licensing exam, you have one year to apply for your salesperson’s license and identify a sponsoring broker-in-charge to sponsor you. A license application will be provided by PSI after you pass the exam. To finalize your salesperson application, submit a license fee of $50, your exam score report, a completed application form, and proof of a sponsoring broker. All real estate licensees in South Carolina are required to take 10 hours of continuing education courses every two years. Agents must take four hours of core classes (such as 3Ps of Professionalism) and six hours of electives, which include subjects like fair housing and property management. Once you earn your license and are ready to take continuing education courses, check out McKissock Learning through Real Estate Express. They offer continuing education packages approved by the South Carolina Real Estate Commission and boast excellent reviews from users. Plus, McKissock offers non-credit courses to help you with subjects like social media marketing. Click here to learn more about McKissock’s continuing education options. How Can I Get My Real Estate License in SC? To get a real estate license in South Carolina, undergo a background check, complete pre-licensing coursework, apply to take the licensing exam, and register for a test date. Once you take and pass the exam, complete your advanced licensing courses, identify a sponsoring broker, and submit your application for a real estate license. How Much Does a Real Estate Agent Make in SC? On average, real estate agents in South Carolina earn a salary of $50,700 per year. Agent salaries range from $23,500 to $91,110, depending on the number of transactions, commissions paid to their brokerage, and how commissions are split. South Carolina brokers typically make an average of $95,566 per year. Visit our guide to real estate agent salaries for more general information. How Much Does It Cost to Get a Real Estate License? The cost of applying for a real estate license varies. Typical costs include pre-licensing education costs, application fees, background check fees, exam registration fees, and costs for exam prep software. In South Carolina, salesperson license applicants must pay $75 in application fees, $63 for exam fees, $40 for a background check, and between $400 and $600 for pre-licensing education. What States Have Reciprocity With South Carolina Real Estate License? Full real estate license reciprocity with South Carolina is available for agents who qualified for reciprocity by written exam in Georgia and hold an active real estate license in Georgia. Agents must complete a Salesperson License by Reciprocity Application, provide numerous administrative requirements, and obtain a SCREC-approved criminal background report. To earn a South Carolina real estate license, applicants must pass a background check, meet pre-licensing course requirements, and pass the exam. Prior to submitting a final license application, aspiring agents must also identify a sponsoring broker-in-charge who will provide oversight as you build your career. Finally, agents and brokers must take continuing education courses every two years to maintain an active license. Whether you need to meet pre-licensing course requirements or want to start preparing for the exam, Real Estate Express offers a broad range of courses to meet your needs. Plus, they offer continuing education packages so you’ll be ready to maintain your license once you start working as an agent. Click here to learn more about Real Estate Express’ offerings. I’ve been a licensed realtor in the State of TN for 4 years now and am looking to get licensed in SC as we will be living there part time. Will I need to enroll for classes there to make this happen? Since South Carolina does not have reciprocity with Tennessee, you will need to take the real estate licensing course there in order to become licensed. Best of luck! I am a broker in ny looking to get my license in sc. Do I need to become an agent in sc first? Or can I just study and take a broker’s test? I am fairly positive you should be able to take your broker’s course and pass the exam in order to become a broker in South Carolina. To make sure, reach out to the South Carolina Real Estate Commission. Best of luck! I just moved here from Las Vegas, Nevada where I have been a licensed Real Estate agent for 14 years– will I still need all the requirements listed above to get my license here in South Carolina, or will I only need to test for the State part of the exam? Since there is no reciprocity in South Carolina for Nevada, you will need to retake the courses and exam in order to get licensed in South Carolina. On the positive side, if you’ve been working as an agent in Nevada for 14 years the exam should be a breeze! WHY DOES THE STATE OF SOUTH CAROLINA NOT OFFER REAL ESTATE LICENSE CLASSES ONLINE ? I have no idea… If you live there you might want to call your governor’s office or state legislature and ask them. Best of luck! I have been an Acquisition Agent for utility companies in the U.S. for 12 years. My work is expanding to States that are now requiring Real Estate Licenses to negotiate & acquire right of way lands in S.C. Do you know if S.C. Real Estate License has portability? Does S.C. Share reciprocity with neighboring states? North Caroline? Also, I rarely am assigned states requiring this RE license. Would I be required to take a national real estate test as well as S.C.? I would appreciate any information you may have regarding what I am required to possess in order to purchase Right of Way & Easements in S.C. & possibly N.C., or Georgia. Thank You, Y Menard. The short answer is that South Carolina has reciprocity with North Carolina, Georgia, and West Virginia. That said, the reciprocity only means you will not have to take the real estate course in South Carolina IF you already have a real estate license in North Carolina, Georgia, or West Virginia. As far as portability goes, South Carolina is what is known as a Cooperative state. That means you can enter the state to do a transaction as long as you are co broking with a licensed broker in the state. Thanks for the update. Will edit the article to reflect the changes.